Even with the outstanding dependability of the Land Rover vehicle line-up, it can be nice to know you have the extra peace-of-mind that comes with a Vehicle Protection Plan. These plans offer protection from the potential costly repairs that could result from mechanical failure. You can incorporate the Service Agreement cost into your financing. There are also some cancellation and transferability options. Some of the components with parts covered by these plans include: transmission, engine, drive axle, air conditioning, heating / cooling, electrical, braking, suspension, steering, and fuel delivery. That means many of the components on your vehicle will have protection using our Vehicle Protection Plan. 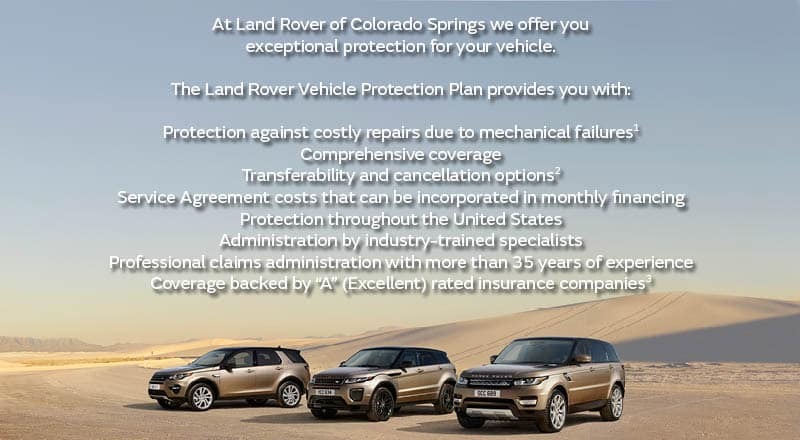 Even better, when you have repairs performed at Land Rover Colorado Springs we will waive your deductible. So, visit Land Rover Colorado Springs today to look at our impressive selection of quality, luxury Land Rover and Range Rover vehicles. Let us tell you about the Vehicle Protection Plan options available to you!